Check out the awesome things going on in technology class at Stone Academy this year! Students in 3rd through 5th grade are using their Digital Passport to travel the world of Digital Citizenship this quarter! Digital Passport is a 5 lesson unit on digital citizenship provided by Common Sense Media. Students will learn about digital communication, internet privacy, being an upstander to cyberbullies, how to perform a safe search, and how to give proper creative credit. Each lesson involves an ice-breaker conversation/activity to start off the lesson, a web-based game that allows students to explore and practice the concept, and a mission that extends the learning and encourages the students to think more deeply about the lesson. Students have greatly enjoyed the games that are part of this curriculum; they can access the site by clicking here and entering their log in information they received in class. Have fun! Congratulations to the cast and crew of The Lion King Jr. for 2 amazing shows! We are so proud of your hard work and appreciate your dedication and effort to make this show come to life! Here are the cast pictures we took with everyone in their LK Tshirts. 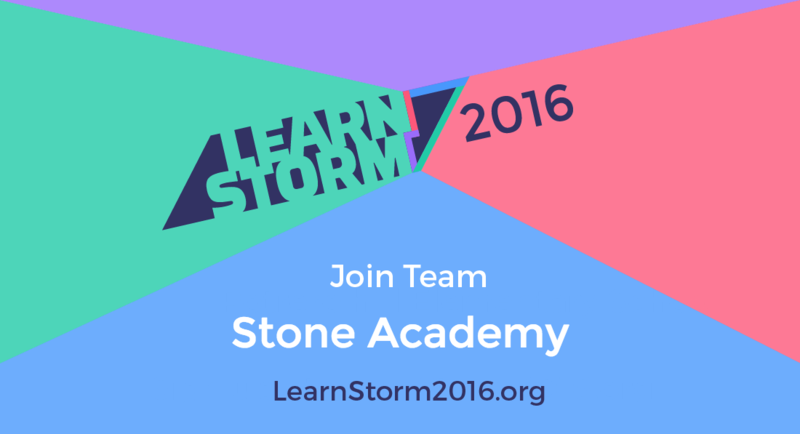 Stone is rocking the LearnStorm challenge! Over the past 3 weeks, Stone students have taken on the LearnStorm challenge by completing math and computer science activities using Khan Academy. Stone students have consistently placed in the top 100 schools in the Chicagoland area in earning Mastery points by completing activities, challenges, and missions on Khan Academy. And, by signing up for the LearnStorm badge on the Chicago City of Learning website, 8th grader Aman won a free Chromebook! There's still plenty of time for students to get involved, and lots more prizes to be won; the LearnStorm challenge goes through April 1st! Good luck and have fun! Stone Academy is joining students across Chicago, San Francisco, Idaho, and Ireland in the LearnStorm challenge this year, sponsored by Khan Academy. Students in grades 3-8 will be working on math skills (and students in 7th and 8th will get to work on some computer programming skills, too!) through specially-designed Khan Academy lessons and challenges, now until April 1st. Learn more at LearnStorm; log in to your LearnStorm team by going to Khan Academy and logging in with your CPS email address! Email Mr. Marsland with any questions; good luck and have fun!! It's that time of year at Stone Academy once again: musical theatre auditions! This year we are doing The Lion King Jr.! Auditions will take place this week; students will learn the material on Tuesday, January 5 then audition on Wednesday, January 6. Students invited to callbacks will attend on Thursday, January 7 for one final audition before the cast list is posted on Friday, January 8. Click HERE to access the practice tracks so you can rehearse the audition material at home! Good luck to all - email me with any questions you may have! 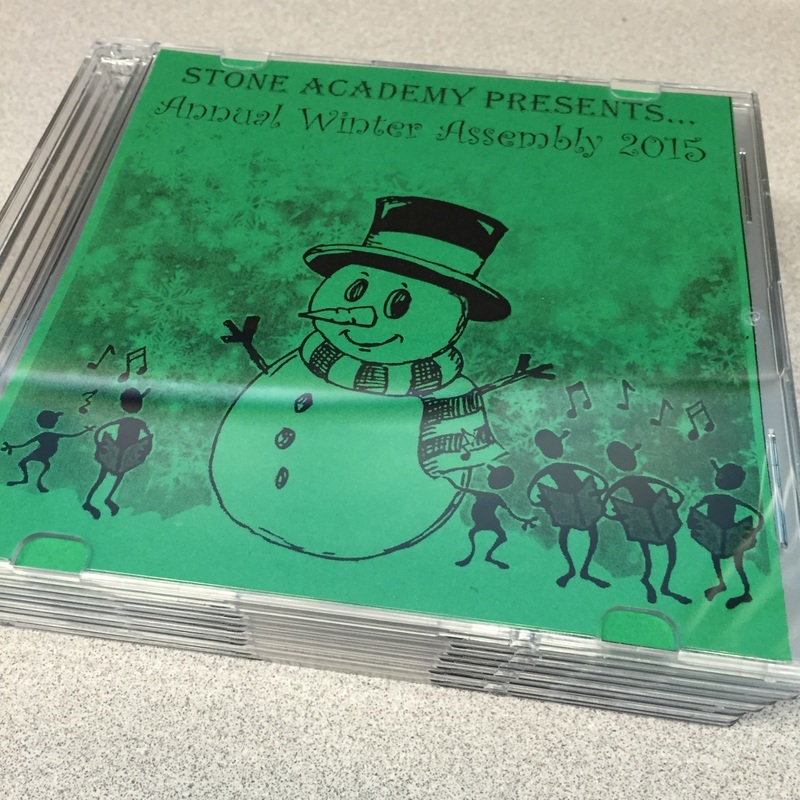 Thank you to everyone who purchased a DVD of this year's Holiday Assembly! The Stone Tech Crew enjoyed filming and taking pictures of the performance, and I got to experience editing the footage in Adobe Premier and making the DVD in Adobe Encore for the first time! Over 150 DVDs have been sold so far; they are still available for $10 in the Main Office or during the Winter Performance on Wednesday, December 16th, with all proceeds benefiting the performing arts and technology at Stone! And, if by chance you received a damaged or inoperable DVD, please contact the Main Office or me at wemarsland@cps.edu for a replacement! All 4th through 7th grade students can access their code.org log in through their Google Classroom (classroom.google.com). I was thrilled to still be able to attend the annual 6th grade trip to White Pines Ranch in Oregon, Illinois this year! We had a blast as always, and learned a lot about nature and the outdoors. Here are the group shots we took on the final day before leaving. Mr. Marsland teaches K-8 technology at Stone Academy in Chicago, Illinois.